Explore the “Big Chip” with your family and friends on one of our pontoons, or top of the line fishing/skiing rigs! Prefer to explore it without a motor? We offer canoes, kayaks, paddle boats and stand up paddle boards free of charge to resort guests, or rent on an hourly basis to the public! Don’t forget your water skis, or rent a tube from us, as there is plenty of lake for everyone to enjoy! The 17,000 acre Chippewa Flowage has excellent musky, walleye, crappie, small-mouth, large-mouth, northern pike and pan-fish fishing. Fishermen can always find a calm place to fish because of the many islands and secluded bays. 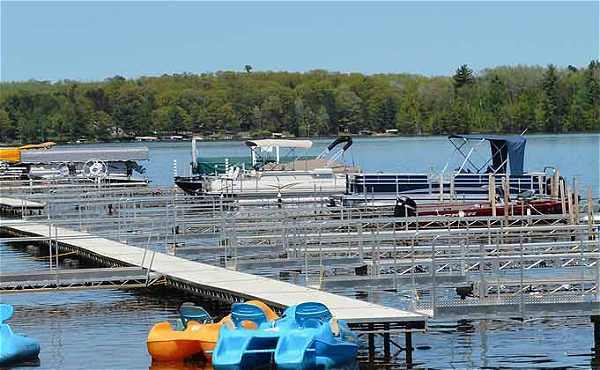 During a stay in Back in RV Site, you can join the thousands in their love affair with the Chippewa Flowage — 17,000 acres of water, 140+ islands, 200+ miles of shoreline — with only 8% developed. Enjoy the fishery with excellent musky, walleye, crappie, small-mouth and pan-fish. If fishing isn’t your thing there’s plenty of wildlife to enjoy such as the majestic bald eagles, black bears, white tail deer, playful otter and countless other species.